Victoria amazonica, the Giant Water Lily of the Amazon, since its discovery in Bolivia in 1801, has captivated botanists and the general public as one of the wonders of the plant kingdom with its enormous size and unique floral biology. 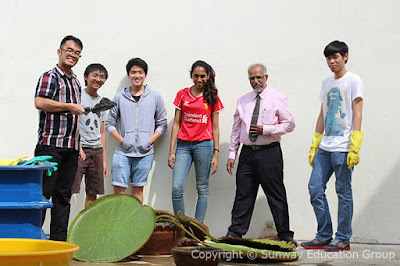 Sunway University’s Head of Science and Engineering Resources Dr K. A. Sagathevan together with his student helper Aaron Ang Chun Hou, former Sunway College’s A-level student, have successfully grew it at the rooftop of Sunway University! 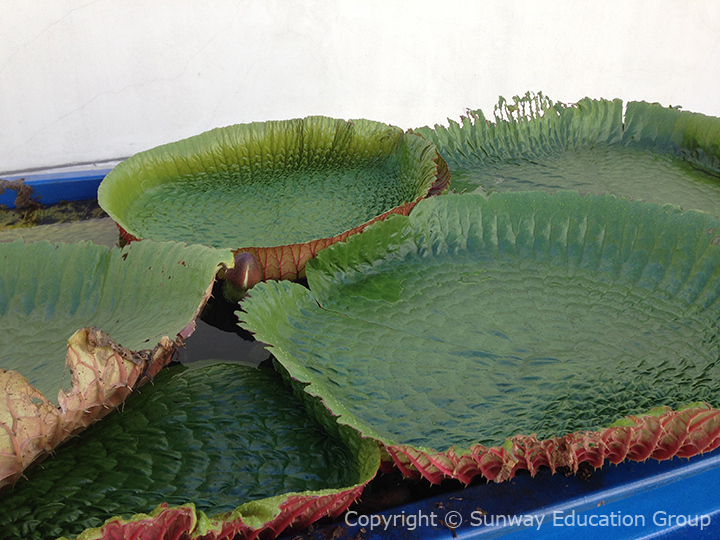 Victoria amazonica is the largest member of the water lily family Nymphaeaceae. It is well known for its huge circular leaves that can potentially grow up to 2.70m in diameter and withstand approximately 50kg, which are often pictured with a small child sitting supported in the centre as a demonstration of their size and strength. Found in shallow lakes and streams of the Amazon, this Amazonian marvel was named after Queen Victoria of England and once caused great rivalry between Victorian gardeners with many failed attempts of cultivating it in English soil. It took about 50 years since its discovery to be successfully cultivated and brought to blossom outside the Amazon in a greenhouse for the first time. The mortality rate of the V. amazonica is extremely high as it requires not only massive care and patience, but also knowledge and expertise. 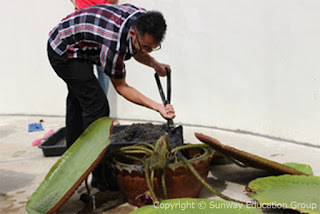 The young plant arrived in Sunway with only two small leaves in April 2014, but under Dr Sagathevan and Aaron’s care, through the initial cultivation in a small tank, subsequent repotting into a larger tank and moving to the university’s rooftop. It has now grown giant, with leaves 4ft long in diameter. The largest was around 4.5ft. Student members of Sunway University’s animal house helped out in the repotting of the giant water lily with Dr Sagathevan (2nd right) From left: Ronny Shieu and Chan Yik Khan from Monash University Malaysia, Michael Chew from Sunway College A-levels, Jothi from Sunway University BSc (Hons) Biology with Psychology, Dr. Sagathevan, and Christopher Liew from Sunway University’s Information Technology. 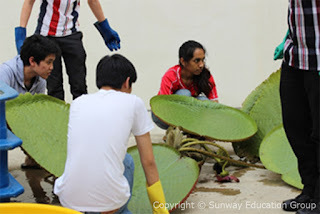 “We can safely say that Sunway University is the first Malaysian private university to breed and grow the Giant Water Lily!” said Dr Sagathevan who has been teaching at Sunway for 25 years. His keen interest in biology has helped establish the university’s very first animal house which has more than 50 species of animals. 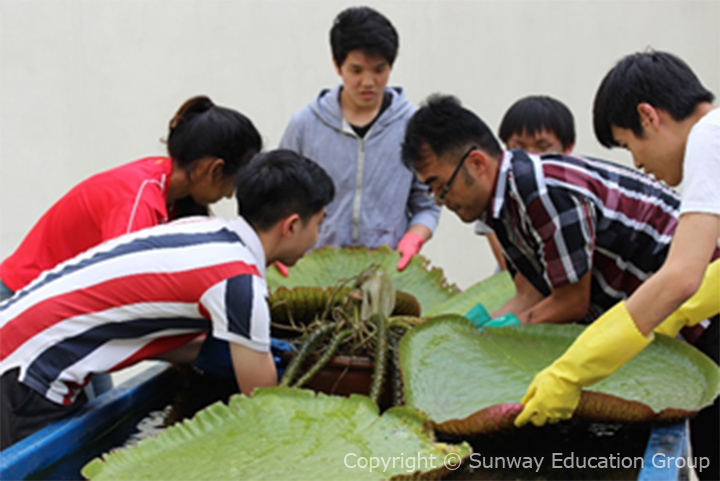 With Aaron’s assistance the plant house now has more than 90 species of exotic plants, which includes the Giant Water Lily. 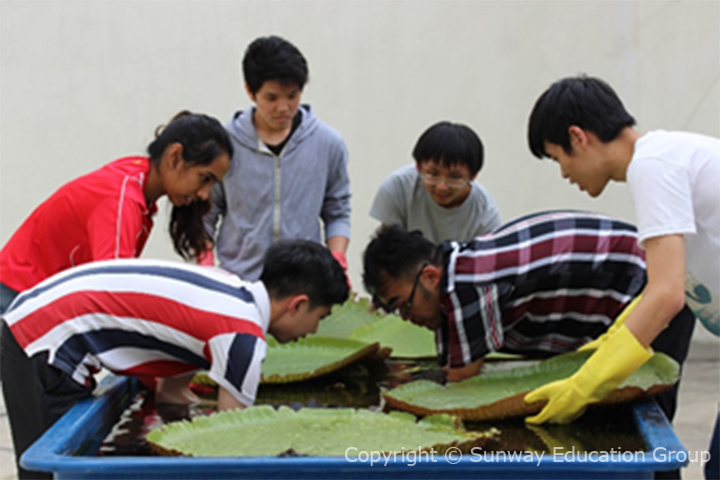 Aaron, a former Sunway College’s A-level student has completed his A-level with straight A* and will be studying Biological Sciences (Plant Science) at the University of Edinburgh. 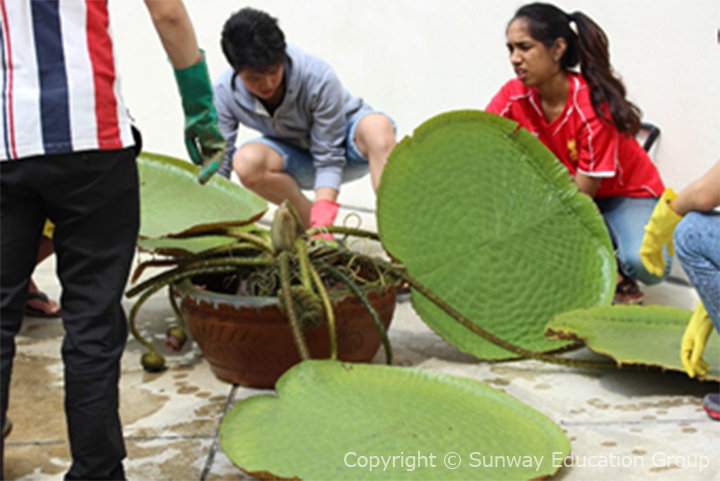 Victoria amazonica has the tendency to ‘uproot’ itself after a long growing season. If left unattended, the plant will diminish in size and vigour and eventually die. Therefore, repotting is an essential process to extend the lifespan of the plant. There are several signs to show the need in repotting, including smaller new leaves in comparison to the old ones, the abortion of flower buds and excessive root above soil level. Aaron, who has always been passionate in plant biology, met Dr Sagathevan through his A-level senior lecturer, Nesa Ramani and since have been working closely together in starting and maintaining the plant house at Sunway University. 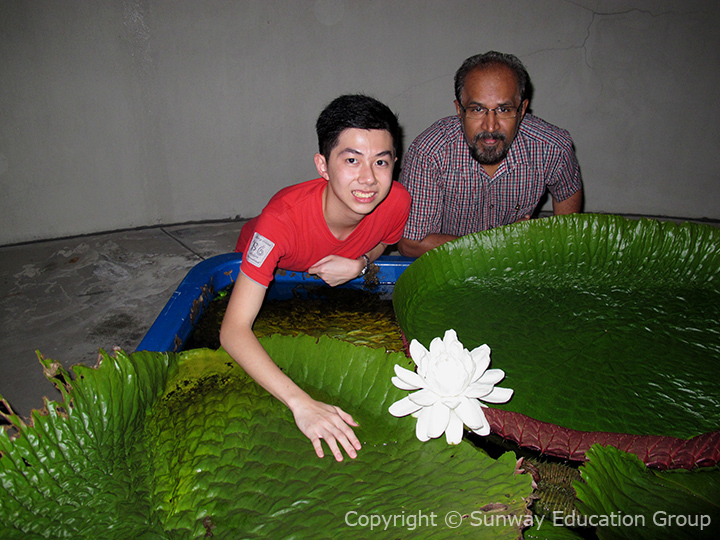 Aaron found the source of Giant Water Lily in a local nursery in Sungai Buloh, which he then acquired and brought to the plant house. The plant flowered for the very first time on the night of 8th April 2015. Another bud emerged and flowered on 12th and 13th April nights. 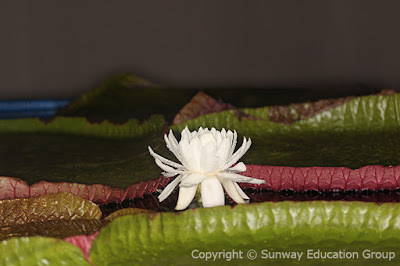 It self-pollinated and produced many seeds which Dr Sagathevan and Aaron collected and stored in a jar of water to keep hydrated for germination into seedlings. 1. 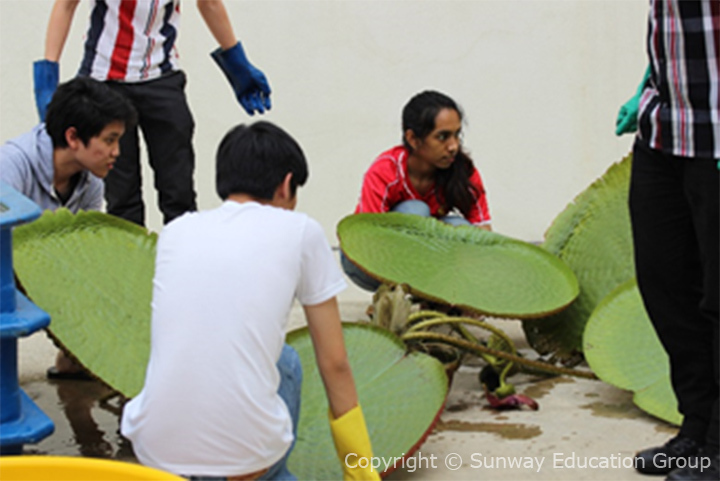 The plant is lifted out of the water. Care must be taken to avoid breaking the leaves, roots or stems to minimise stress to the plant. 2. The plant is gently placed on the ground. Support is given to the leaves to prevent damage. 3. The plant is slowly wrestled out of its old pot without breaking its roots. If the root growth is very extensive, preserve the younger feeder roots and cut off the bottom half of the rootball. 4. The plant is then transferred to a new pot. The same pot can be used to retain the same size. 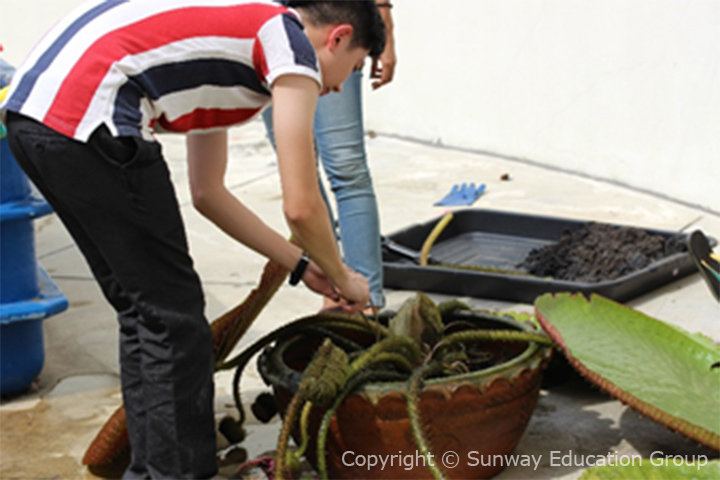 The plant should be transferred to a bigger pot for it to grow larger as the plant size correlates to pot size. Fertiliser in the form of pond tabs is added to the soil. 5. Fill the gaps in the pot with soil to cover the young feeder roots and keeping them below soil level. 6. Finally, the plant is placed back into water. Again, care is taken to avoid damage to the plant.